I recently dyed my hair a dark brown colour, so I had to go make up shopping for a slightly darker foundation. Casper the friendly ghost is never a good look for me haha. I also got this nail polish for £2 instead of £7 with a handy little Boots voucher ;) It makes me sigh at how many of those vouchers I have probably binned..You save £5 on any No7 product..Common sense Jade, common sense please. 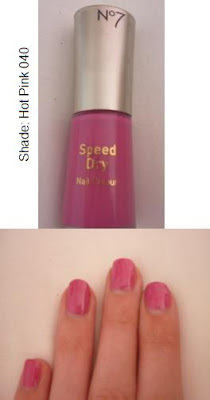 Anyway, for the nail polish, I LOVE it! The picture isn't very clear, due to my crappy camera but it's a lovely fuchsia pink colour. It's matte and has a nice shine to it - very Barbie like ;) Anyway, I definitely recommend you saving the vouchers when you go into Boots. I've already bought 3 of the nail polishes! 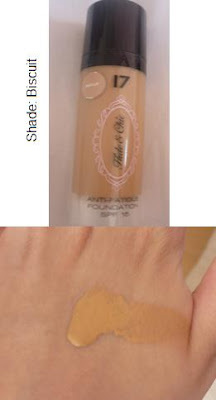 I think I mentioned them in an earlier post..
For the foundation, I wanted something cheap but something with a matte coverage. I'm pretty self conscious about my skin...I don't have any spots or redness but I just need to feel covered or I'm constantly checking myself in mirrors all day. It's a very annoying habit I have. Anyway, I was going to buy a collection 2000 one but the bottle was tiny! So, I looked at 17s Anti-Fatigue foundation with SPF 15. I got a fairly dark shade, but when I applied it to my jaw, it blended in perfectly. That's a trick a learnt from a make up artist - never test foundation out on your hand, because your face and hand are completely different shades. My hand are always like a red colour.. Anyway, I love this foundation! It's smooth and creamy and applies on the skin really well. It's perfect for anyone who wants a full coverage and it's a bonus that it has sun protection in it. Although, your not supposed to just rely on foundation with SPF. You need sun cream too! It was only £6.29 for a 30ml bottle..that's pretty good right?! Another thing I really liked about it, is that the case is plastic so it won't smash when I carry around my make up bag! I hope I covered everything..
great review! i really need a new foundation. Your welcome =] Arrr wow really?! Are you in 2nd year too? How are you finding your course? & thankyou Autumn =] This foundation is definitely worth taking a look at! Umm..the last thing I bought was a £4 grey tie up top from Primark!